The restored heritage-listed, Scottish baronial-style Burrumbeet property dates back to 1838 when built by brothers Thomas and Somerville Learmonth. The granite manor surrounded by traditional English gardens, 80 hectares of farming land and restored farm cottages including stables and shearers’ quarters. When the war is over, Baden Powell, will, it is said, after a spell in England, visit Australia, and Ballarat particularly. His brother, the late George Baden-Powell, M.P., married one of the Ballarat Wilsons shortly before his untimely death, and B.P. 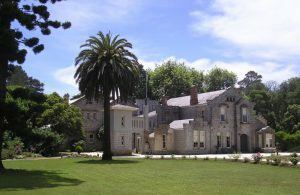 has heard so much of the place from Gordon Wilson and Lady Sarah that he will make a crow-line for Ercildoune and the Eureka Stockade as soon as he is free for such a holiday. Please note, we (John & Christine Dever) do not own the property any longer but will continue to manage the website as a historical resource regarding the property, its previous owners and their historical significance in Australia and Victoria’s heritage.